Gujarat ranks tenth among 21 major Indian states in top consultants McKinsey Global Institute’s (MGI’s) new Female Empowerment Index (Femdex), released recently. A decade ago, a United National Development Programme (UNDP)-sponsored report, released by the Ministry of Woman and Child, Government of India, came up with an almost ranking, putting Gujarat as an average state in what it called Gender Development Index (GDI). The calculations made by the MGI, on a scale of one, gives Gujarat a Femdex value of 0.56, which is lower than Kerala (0.67), Himachal Pradesh (0.63), Tamil Nadu (0.60), Maharashtra, Andhra Pradesh, Telangana, Punjab, and Karnataka (all 0.59), and Uttarakhand (0.57). The report, titled “The power of parity: Advancing women’s equality in India”, says that the state-level Femdex scores range from 0.42 to 0.70. 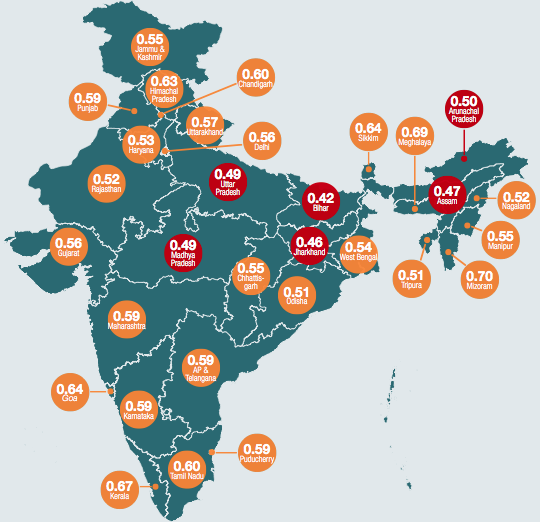 It finds that some of the lower states such as Mizoram, Meghalaya, Goa, and Sikkim have considerably good Femdex scores, ranging between 0.70 and 0.64. The lowest five state Femdex scores (in increasing order) are in Bihar, Jharkhand, Assam, Madhya Pradesh, and Uttar Pradesh, ranging from 0.42 to 0.49. The scores suggest, according to the report, that gender equality levels in these states is as low as those in Chad and Yemen, which have a Femdex of 0.47 and 0.45, respectively. “The bottom five states account for some 32 percent of India’s female working-age population, representing a large opportunity to improve India’s national position on gender equality”, the report comments. Though the report believes, “aggregate Femdex scores are highly correlated with per capita GDP (r=0.68, based on a correlation with log of per capita GDP)”, it does not say why Gujarat fairs badly in Femdex despite its per capita GDP being one of the highest in the country. The McKinsey report merely says, “There are outliers. For example, Kerala has slightly lower per capita GDP than Maharashtra’s, but a significantly higher aggregate Femdex of 0.67 compared with 0.59 in Maharashtra.” Despite Gujarat’s per capita GDP being one of the highest, it scores 0.56. “The strong linkage between gender equality in work and in society that McKinsey Global Institute identified in its global research holds true for India’s states (r=0.65). As is the case globally, Femdex scores for physical security and essential services are significantly higher than those for gender equality in work”, the report says.